It was logical, courageous, and a bit disruptive. It was eventually measured defiant and consequently criminal. No, she said. No. She was not going to get up from her seat on the bus for no white guy or black guy or fat guy or some other guy. And it was less about race and it was even less about gender or timing or the fact that the bus idled in the town of Montgomery, Alabama and not New York City or Los Angeles or Chicago or Butte, Montana. Rosa Lee Parks was tired. She was there first. This was her seat, not anyone else’s. She paid for it, and she was not giving it up. Feet hurt. Got a seat. Paid in full. Not going to take it from her. No, sir. Not you or anyone. She was tired, all right. She was tired of the whole bus business and the Jim Crow business and the American business of “Liberty and Justice for Some.” And she was tired because since she was a little girl she watched buses pass her by for school. She could see the white people dressed in their finery sitting comfortably. She was damned tired from attempting to cast a vote in three elections before her vote was counted. She struggled just to be included in the 7% of black high school graduates nationwide. She kept silent as she was passed over for work time and again, while the comfortable white bus passengers took a job she was more than qualified to handle. She was tired of being tired. No good reason. No sensible explanation. Law? No. Race? No. Pride? No. She was just tired. Staying put. Eight years before her bus seat became the most famous seat on any mode of transportation in the history of human dignity, Rosa Lee dove into the Civil Rights movement. That was 1943, when the Civil Rights movement was something of a faint murmur. In the South, it was like breathing under water. And this was when her country was busy freeing people of other nations, while her people were not free. Nowhere close to free. A few months before her bus seat became the most discussed instrument in the pantheon of democracy, a 15-year-old girl by the name of Claudette Colvin refused to give up a bus seat to a white man. Imagine that. What a coincidence. Not so much. Colvin was counseled by Rosa Lee. Rosa told her to “always do what is right.” Little Claudette did, and she was hauled off to prison. 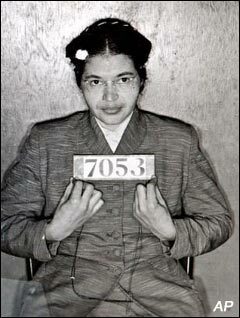 It was Colvin, not Rosa Louise Parks, who should have been the shining symbol of Civil Rights, but turns out Little Claudette was pregnant with the child of a much older man out of wedlock, and in 1955 Alabama, many who ran the movement felt this subject to be anything but sympathetic. So there was little hubbub for Little Claudette, but Rosa Lee did not forget. She was, after all, tired. She did not forget that the bus driver on the day her seat became the most famous seat in the fight for equality, James Blake, was the very same one that forced her to walk five miles in a driving rain because she entered through the “white front door”. Rosa Lee remembered how tired she was then. She remembered the humiliation then. Decided she was tired of being tired. December 1, 1955, Rosa Louise Parks was asked to vacate a seat in the middle section of the bus, the section open to African Americans only if there were no Caucasian Americans present. This was law; Section 301 (31a, 31b and 31c) of Title 48, Code of Alabama, 1940 and Sections, 10 and 11 of Chapter 6 of the Code of the City of Montgomery to be exact. It so happens on that day when a Caucasian American wanted her aisle seat, she politely moved to the window seat. Why not? She would kindly do the same for anyone; black, white, fat, tall, dumb, rich or poor. But damned if Rosa Lee was going to leave the window seat. No good reason. No sensible explanation. Law? No. Race? No. Pride? No. She was just tired. Staying put. And so Rosa Louise Parks was dragged off to prison. But unlike Little Claudette, she was married and not with child. She was employed, articulate, motivated, politically savvy, and experienced in the denial of basic rights granted by the United States Constitution. Most of all she was beyond tired. In another words she was trouble – trouble, and the perfect subject for change. Three days later a minister from the Dexter Avenue Baptist Church by the name of Martin Luther King rose up from his chair in the Montgomery Improvement Association and helped plot the Montgomery Bus Boycott. The following months some 40,000 black commuters walked in the cold and snow to honor it, for many it meant 20 miles or more. The transit company stalled and began to crack. It was simple: Lift segragation or prepare for bankrupcy. Nearly a year later the United States Supreme Court banned segregation on buses. Only then was the boycott lifted. There was still a long way to go, but it was a start. Thanks to a brave and fed up woman who was simply, irrevocably, vehemently, immovably tired.